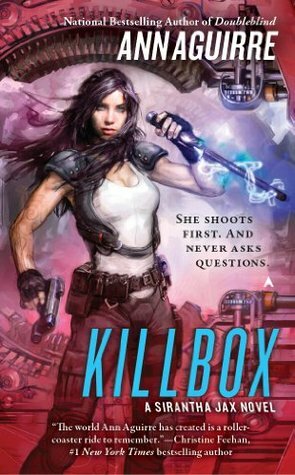 Oh man, have I ever been looking forward to reading Killbox. Ever since Ann Aguirre was kind enough to stop by last month to give us a sneak peak at Jax's newest adventures I've been anxiously awaiting this newest ride. And what a ride it was. Having just come off a mentally (and physically) grueling assignment as an ambassador for the Conglomerate to Ithiss Tor, Sirantha Jax would like nothing more than to rocket herself back into grimspace with March by her side. But with the alarming rise in recent Morgut attacks - a highly advanced, yet nasty group who leave no survivors - the Conglomerate is scrambling for a way to protect ships and remote outposts from utter decimation. As all-out war explodes, Jax and March must gather (and train) a rag-tag militia while Jax continues to test her body's limits as a jumper in hopes of gaining any advantage over the terrifying force of the Morgut. I have no idea how Ann Aguirre keeps doing it. Really. The woman must be a mind-reader like my favorite dark hero March to be able to manipulate my emotions this effortlessly, because honestly, there wasn't a chapter where I wasn't afraid for, mad at, or elated for any one of her amazing characters. Nothing comes easy or without a struggle this time around (but really, when has it ever for Jax?) and Jax is especially feeling the strain of having to separate indefinitely from those who she has come to rely so heavily upon. War is always a time for goodbyes and loss yet in no way could Killbox be described as a purely emotional book without any action. Whereas Doubleblind focused more on Jax learning how to control her impulses and learning to fight with words, Killbox returns once again to her trademark let's get this done fighting style. But she's also a more mature Sirantha Jax who weighs the outcome of her actions and decides to go to bat even when she isn't sure of the outcome. Time and again, we see a Jax who rationally evaluates a dangerous situation, makes the hard choice (which usually involves putting herself at risk), and then rushes forward with guns blazing. I'd say the woman is a machine to continue putting herself in danger like that, but truly she's not. Jax has so much heart that it makes her choices that much more admirable and extremely heart-breaking once you understand her reasoning for such crazy actions. And as for the ending? Yeah, my tender emotions were pretty much already fried from the rest of the book, so it was nothing short of cruel to be left with such a crazy cliff-hanger ending! I honestly have no idea where Ann Aguirre is going to take Jax next but you better believe I don't want to miss a second of it.